In 1940, due to the box-office failures of Pinnochio and Fantasia, Disney was forced to make lay-offs. By this time the pay structure at the Disney studio was very disorganized with wages ranging from $300 at the highest to $12 a week at the lowest. Many of the employees were unhappy and joined the Screen Cartoonists Guild, including Art Babbitt, one of Disney's highest paid animators, who was sympathetic to the union cause and openly disliked Walt. Tensions between Disney and Babbitt reached a peak when Babbitt became one of the union leaders. Disney later sent a letter of termination to Babbitt citing his cause - union activities. This was the final straw. The next day on May 29, 1941, more than 200 members of the studio staff walked out on strike. Despite being one of the highest paid animators at Disney, Babbitt stood up for the lower-ranking employees, and the union. He was one of relatively few well-paid artists to join the strike, and he became one of its main leaders. 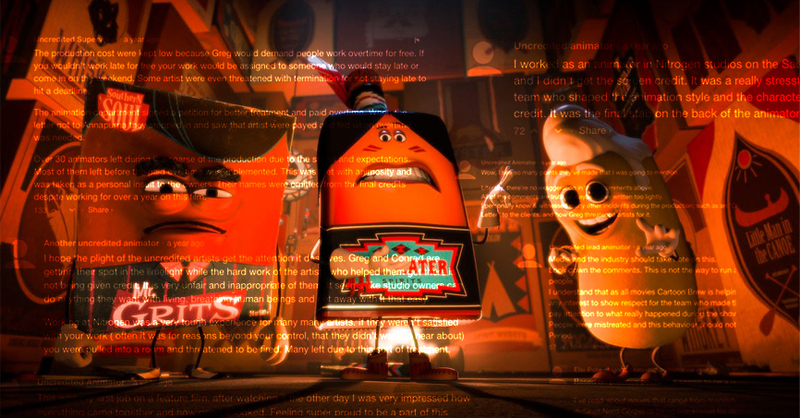 on the production of Sausage Party, a group of concerned animators gathered together in an effort to change working conditions that we know are pervasive across our industry in Vancouver. We have been working closely with representatives at IATSE to develop strategies and efforts to improve issues such as unpaid overtime, low wages, job instability, lack of benefits, and work related health problems. We believe that all of these issues will be best solved through the unionization of our industry. First and foremost, we are a community group. We invite conversation, discourse and participation from artists of all opinions. The issues we face are multiple and complex, and as such will require complex solutions. We are the animation artists that make up this industry, we pour our souls into the craft and we have worked too long for too little. We are skilled, we are essential, we are animation. If you are an animation worker and would like more information about us, to find out more about our next meeting, or to ask a question - please use the form below.